Samuel Book p127-8: John Samuel Leavitt was born 6 Jan 1829 Tuftonboro NH, d 25 Nov 1909 Gorham ME (D/C says age 79,10,19 making the 1830 correct). Married Lydia French of Farmington NH 1 Apr 1821. Front of cemetery along Main Street Rt 25. Click for larger photos; photos by Roland Rhoades of Gorham 2010. [Family listed in the Descendants of Thomas Leavitt 1953, pg 91, under Robert and Sarah (Chute) Leavitt, with the note: "may not belong to this family"
NOTE: I visited this cemetery in June, 2015, but a rainstorm followed me there, so none of my pictures of these Leavitt stones came out clearly. I need to return here for retakes. - Steve D.
[Family can be found in the Descendants of Thomas Leavitt, pg 177]. 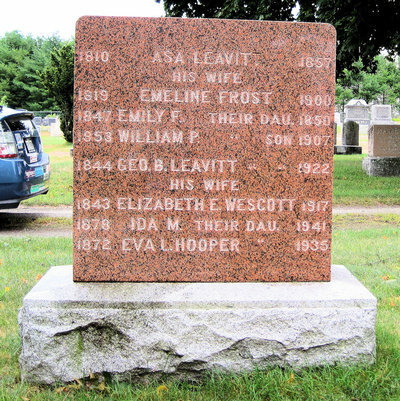 ​The son of Daniel and Sarah (Sands) Leavitt. 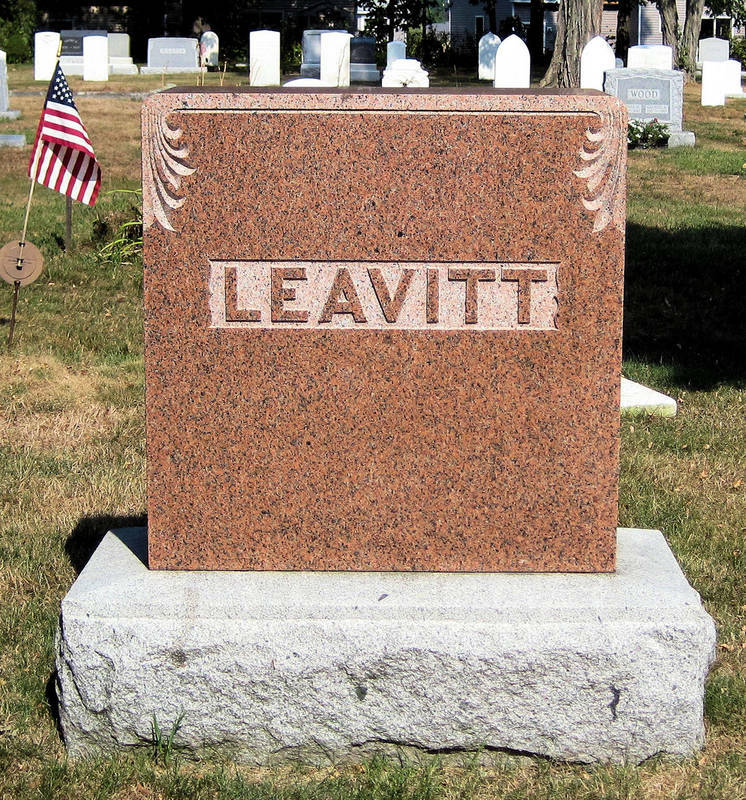 He was a veteran of the Civil War, serving as a corporal in Company C, 27th Maine Volunteers. He was promoted to Sgt on 1 Mar 1863, and served until being mustered out on 17 Jul 1863. He removed from Buxton, Maine to Yarmouth between 1863 and 1870, and lived there until his death, working as a mill wright/machinist.